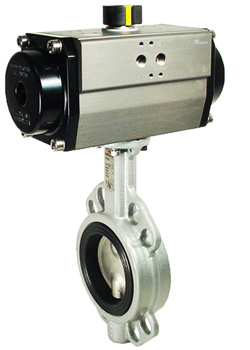 Air actuated soft seated butterfly valve for on-off control of air, oil and other media compatible with the materials of construction. Wafer style valve sandwich mounts between standard ANSI /ASME B16.5 Class 150 flanges and other international standards. Spring return actuators use an air pressure signal (80-120 PSI) to open and springs to close the valve. The valve will fail closed upon loss of air signal. Direct Mount Butterfly Valve Wafer NBR 3"